This is a recipe for beef pares mami. It is a type of beef noodle soup that makes use of fresh miki noodles. Vanjo, I have been following you since I found out about your website panlasangpinoy. 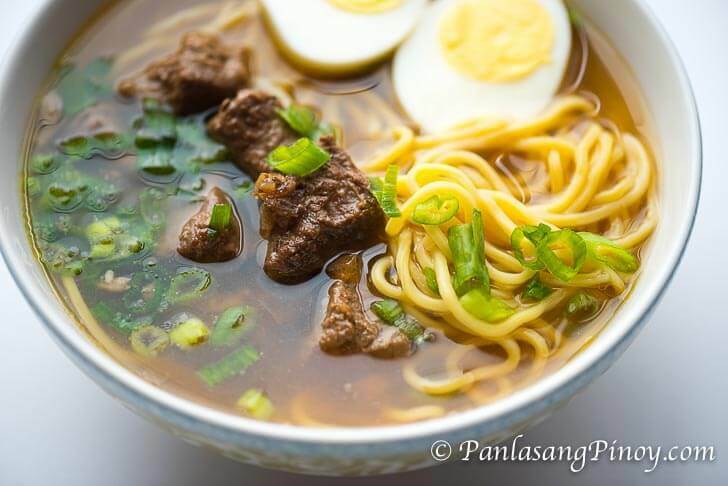 I just made this beef pares noodle recipe. Oh my gosh!!! this is a killer even my picky daughter said she liked it. Thank you so much for the recipe. I am glad that you liked it. Enjoy! ask ko lang po how to prepare the egg noodles? ready to eat na po ba ang nabibili sa mga grocery stores? Ghing, yung miki noodles na ginamit ko ay nabibili sa grocery store. Hindi ito ready to eat, kailangan pang lutuin kaya niluto ko sa sabaw. Kung egg noodles ang gusto mong gamitin, may nabibili rin sa grocery. Thanks for sharing this recipe. I just tried it and it really hit the spot! The only downside was the miki noodles that I made myself. I live in Chicago too, so I wanted to ask which grocery you recommend I buy the noodles from? Thanks again!